(NaturalNews) This is a continuation from Part Three of a comprehensive investigative report revealing the untold story behind Jon Entine, biotech shill, character assassination operative, Forbes.com writer, American Enterprise Institute fellow and George Mason University research fellow. Entine also has ties to Monsanto and the Bill & Melinda Gates Foundation. One of Jon Entine's behavioral patterns is to engineer wildly defamatory articles to be published in the media -- including Forbes.com -- knowing that those articles will likely result in him being sued. JON is writing a controversial article for Vanity Fair Magazine, for which he anticipates that he will be sued for defamation. Arthur E. Berman, a petroleum geologist and consultant to the energy sector; editorial board member of The Oil Drum; Associate Editor of the AAPG Bulletin; Director of The Association for the Study of Peak Oil, wrote a letter to George Mason University dated July 4, 2011, that he also posted online on his blog, in which he sought to refute claims and assertions made by Jon Entine in his Real Clear Politics column published a few days earlier, on July 1, "Natural Gas "Bubble" Report: Market Tinkering or Shoddy Reporting?" His post contains errors, exaggerations and untrue statements that cannot be substantiated, and thereby jeopardize George Mason University's legal position and reputation as an honest broker of information. In his customary role of a belligerent bully as abundantly shown in parts One, Two and Three of this investigative series, Jon Entine threatens to sue others who merely call into question his own qualifications for things like giving speeches. 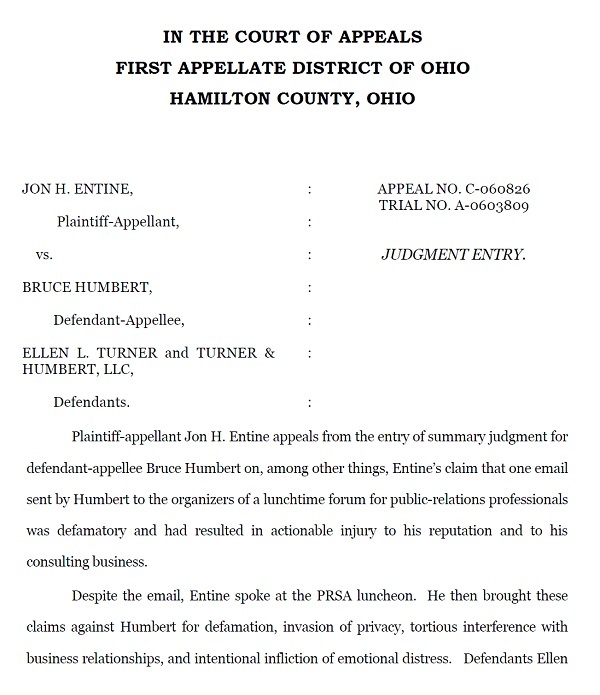 The following court document describes how Entine unsuccessfully attempted to sue a man named Bruce Humbert who questioned Entine's qualifications in an email to colleagues. Entine claimed that "one email sent by Humbert to the organizers of a lunchtime forum for public-relations professionals was defamatory and has resulted in actionable injury to his reputation and to his consulting business. ... He brought these claims against Humbert for defamation, invasion of privacy, tortuous interference with business relationships, and intentional infliction of emotional distress." Fascinatingly, these are precisely the sorts of things Jon Entine commits against others. He knowingly defames people and spreads false information to destroy their reputations. He interferes with their business practices and inflicts emotional distress. The very things Jon Entine accused Humbert of committing are the same tactics used by Entine himself against GMO skeptics and scientists like Seralini. 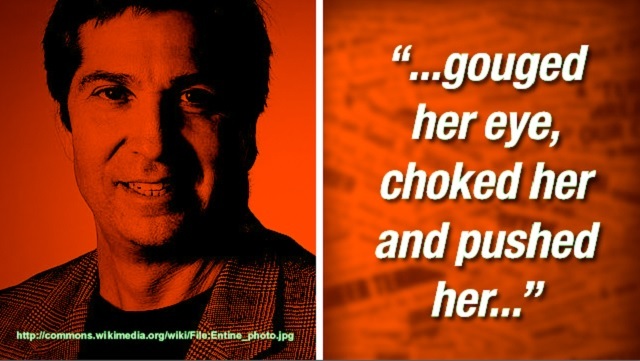 As this investigative report clearly shows, Jon Entine is willing to fabricate false evidence, deliberately falsify "facts" to disparage his targets, invoke knowingly false allegations and engage in a vast array of contemptible violations of journalism ethics in order to destroy the reputations of his intended targets. According to his own wife's sworn court documents, Jon Entine engaged in domestic violence, child abuse, and attacked his wife by gouging her eye and choking her, then throwing her. Entine is also an apologist for deadly chemicals that threaten life and poison humanity. Those chemicals, it turns out, are another form of violence against women, men and children. This excellent article on PR Watch reveals Jon Entine's involvement in the greenwashing of atrazine, a deadly pesticide chemical which Entine implies is completely harmless. This collection of unsealed court documents reveals the key players of the "pesticide apologist gang" -- called the "White House Writers Group" -- who were all part of a coordinated effort to spread the message that atrazine is harmless by invoking phrases like "sound science." • John Stossel, whom Jon Entine partners with to broadcast GMO corporate propaganda. • the American Enterprise Institute, where Entine is a research fellow. • the Pacific Research Institute. • John Miller, a pro-GMO scientist who was a key figure in lying to California voters to defeat the GMO labeling ballot measure there. • "Highly influential Washington insiders and policy leaders." A far more detailed list is revealed in this PDF document which shows the Syngenta P.R. team outreach list. This list includes the American Enterprise Institute and a long list of corporate front group non-profits and universities whose "scientists" are shills for the biotech industry. Click here to continue with Part Five of this comprehensive investigative report by Natural News.